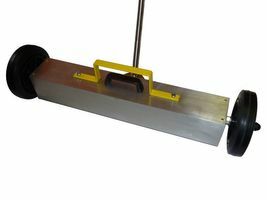 Magnetic Sweepers with Neodymium Magnets are the best solution for quick, easy and safe cleaning of large areas for nails, swarf and other ferrous metal objects. For large car-park areas, you simply cannot go past the speed and efficiency of a magnetic sweeper for picking up objects that may puncture tyres etc. With our many types of magnetic brooms and sweepers you have a dozen or so good reasons to remove metal fragments from the workplace and surrounds. Magnetic Sweepers are the best solution for quick, easy and safe cleaning of large areas for nails, swarf and other ferrous metal objects. For large car-park areas, you simply cannot go past the speed and efficiency of a magnetic sweeper for picking up objects that may puncture tyres etc. With our many types of magnetic brooms and sweepers you have a dozen or so good reasons to remove metal fragments from the workplace and surrounds. In a transport yard, the cost of a magnetic sweeper can pay for itself immediately in the downtime and cost associated with repairing tyres on trucks. AMF Magnetics' magnetic sweepers are strong and sturdy and come with large rubberised wheels for easy handling. The comfort grip on hand held models makes extended periods of use a breeze. The best part about many of these powerful magnetic sweepers is their self-cleaning ability. Simply wheel the sweeper around and when you are finished place the unit over the receptacle and pull the handle. Cars, trucks, motorbikes and goods deliveries routinely express ferrous waste. Metal pieces present long lasting health and safety hazards to staff and customers. Our magnetic sweepers do not cost you money, they make you money! Who supplies high quality Magnetic Brooms Sweepers with Neodymium Magnets? 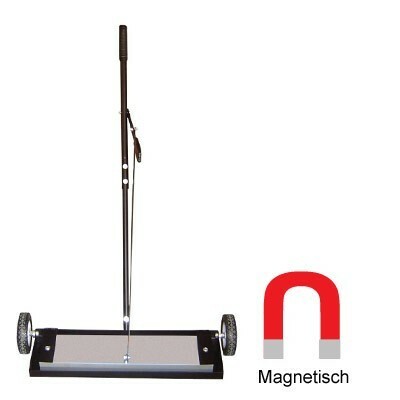 Magnosphere offers best priced Magnetic Brooms Sweepers with Neodymium Magnets globally to all industries, including Automotive, Aerospace, Military, Advertising, Design House, Electronic and Academic/R&D. Please inquire for custom Neodymium magnets or magnetic assembly. Buy Magnetic Brooms Sweepers with Neodymium Magnets at Magnosphere and get a better deal!